Results of IDC’s latest Worldwide Quarterly Mobile Phone Tracker yield some interesting points to ponder on about the current state of the smartphone industry. And being a smartphone addict that I am (I’ve got an iPhone and Nexus One right now and I’m still planning to get a BlackBerry in a couple of days) it’s quite interesting to take a look at this report. According to IDC’s report, a total of 54.5 million units of smartphones were shipped in Q4 2009, up by 39% from the same quarter in 2008. Total shipment for 2009 was 174.2 million units, up by 15.1% from 151.4 million units in 2008. In addition, smartphone shipments accounted for 15.4% of all mobile phone shipped in 2009, up from 12.7% in 2008. Drilling down to the top five smartphone brands, Nokia still leads the pack with a 37.6% growth in Q4 2009 and 11.9% growth from 2008 to 2009. RIM with its BlackBerry devices follows at close second while Apple, HTC and Samsung complete the top five smartphone brands in 2009 and Motorola replacing Samsung in the top category for Q4 2009. Now his the interesting part. Apple’s market share grew by a huge 97.7% in Q4 2009 and 81.9% from 2008 to 2009. You know why this is interesting? Apple was able to achieve this feat with only one smartphone available in the market, the iPhone 3GS. While both Nokia and RIM both got several smartphone units. Nokia has the 5800, N97, N97 mini, 5530 and other latest models, while RIM has various BlackBerry devices. 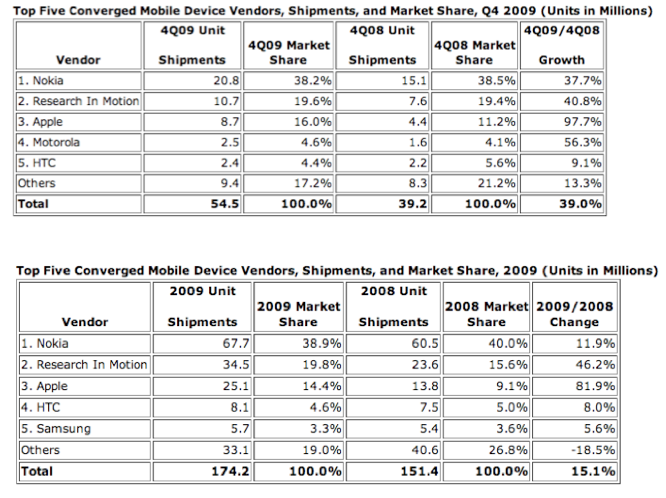 Another interesting point to note is Motorola’s growth in Q4 2009. The report may not have factored in sales coming from the MOTOROLA Droid. And this is expected to grow in the coming months especially if Motorola releases another Android phone. Samsung is also releasing another Android phone. Would the availability of more Android phones affect the iPhone’s dominance in the smartphone market? That would be interesting to find out. Will Nokia continue to dominate the market for smartphone especially right now that the OS for most its smartphone is already in open source? Will Apple be prompted to release a iPhone this year to fend off the threats posed by its rivals? Well, it looks like it’s going to be another exciting year for the smartphone market. And we will be watching it closely.